Aliens Vs. Predator wasn't designed from the ground up for co-op, but there's still a good co-op experience to be had in Survivor mode. Similar to Gears of War 2's Horde mode, Survival puts you in the shoes of a squad of Colonial marines, taking on wave after wave of Alien invaders. As with all similar modes, a variety of maps makes a big difference, and more will soon be available. 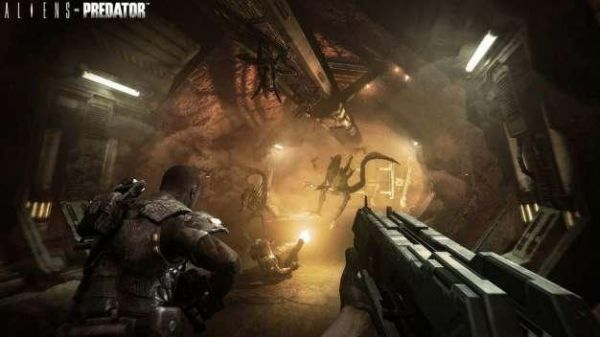 The first DLC for AVP, appropriately called the "Swarm Map Pack", adds two new Survival mode maps that were previously available only to those that purchased the collector's edition of the game. • Outpost: The site of the original Weyland-Yutani colony on BG-386 was abandoned, and soon reclaimed by the planet’s voracious jungle plant life. • Hive: Deep in the heart of the Freya’s Prospect Refinery lays the Xenomorph Hive. Two more multiplayer maps are included in the pack, as well. It'll be available on March 18 for the PC, PS3, and Xbox 360, for 560 MS Points or the equivalent in Colonial credit. Page created in 0.2289 seconds.